Eugene entrepreneur and former Palo Alto Software executive, Caroline Cummings, has been named Catalyst Manager for the Regional Accelerator & Innovation Network (RAIN). She will begin her new position on July 20, 2015. As RAIN’s Catalyst Manager, Cummings will be responsible for leading and managing resources to support start-ups in the RAIN region, including the counties of Lane, Linn, Benton and Lincoln. The Catalyst Manger’s job description includes developing and maintaining a mentor network; providing leadership for regional entrepreneurial initiatives such as the Willamette Angel Conference; and connecting traded-sector RAIN start-ups to people, funding, and physical resources such as equipment or office space. Making sure traded sector startups in Lane, Linn, Benton and Lincoln counties get the resources they need to launch or grow. This includes helping recruit angel investors so that the startups have a base of capital to help them scale – as well as create and launch an online mentorship database/platform for entrepreneurs to find mentors. For the past three years, Cummings has been vice president of business development for Palo Alto Software, an international leader in business planning software development and content marketing. “Caroline has a drive for success and a passion to bring out the best in others,” said Sabrina Parsons, CEO of Palo Alto Software and past chair of the RAIN board of directors. “We will miss her passion at Palo Alto Software, but are pleased her talents will be available to the entrepreneurs participating in RAIN. Palo Alto Software has always been a big supporter of the local entrepreneurial efforts in the Willamette Valley, and we are all excited at what Caroline will do to move RAIN forward. Prior to joining Palo Alto Software, Cummings was the C.E.O. and co-founder of two technology startups, includingRealLead.com, a mobile marketing technology used by real estate agents that was acquired by IDX in 2012. 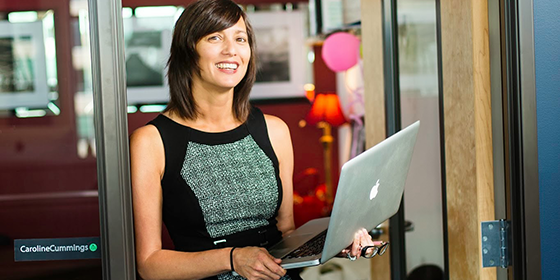 She’s raised just under one million dollars in capital from Oregon angel investors. She additionally co-founded Smart-ups Pub Talks and gifted the program to the Eugene Area Chamber of Commerce in 2011. During her tenure with the Eugene Chamber she co-founded the Southern Willamette Angel Network and managed the production of the Willamette Angel Conference. A Drexel University graduate, Cummings mentors entrepreneurs locally and around the globe through Mercy Corps. She is also the past president of the Big Brothers Big Sisters of Lane County board of directors, and currently mentors through the local non-profit, A Family For Every Child. The Governor’s Regional Solutions Office was the catalyst for RAIN. Its original leadership team comprised of former Corvallis Mayor Julie Manning, Mayor Kitty Piercy, State Senator Lee Beyer-chair of the Regional Solutions Advisory Board, and the Vice Presidents’ of Research from Oregon State University and University of Oregon, partnered with the private sector to create an environment where innovation is encouraged, and where start-up and early stage companies receive the support they need to put down permanent roots in our communities. To further the initiative throughout the region, RAIN supports the OSU Advantage Accelerator relationship with RAIN Corvallis as well as the RAIN Eugene accelerator, managed by the University of Oregon and Eugene Area Chamber of Commerce. To date, 48 companies started by faculty and/or students at either university, or by community members in the region, have entered the accelerators. Graduates of the RAIN accelerators are having a positive impact in the region. RAIN companies have created 30 new full-time jobs and generated $5.2 million in new local revenue.